Alejandro Diaz cleverly explores the boundaries of race and class by merging humor, urban imagery, fine art, and advertising. His conceptual and campy cardboard signs, which he made and sold on the streets of Manhattan, earned him an international reputation. 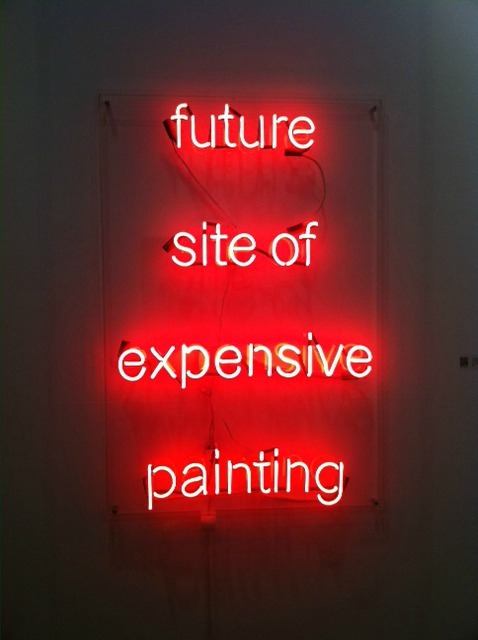 From these humble, handwritten signs to his glamorous works in neon, Diaz continues to challenge the preconceived notions of culture, society and status. Diaz has exhibited at the Brooklyn Museum of Art, NY and the Aldrich Contemporary Art Museum, CT, among others. Diaz has had public installations in New York, San Antonio, and St. Moritz. He is included in the permanent collections of the Los Angeles County Museum of Art, the Scottsdale Museum of Contemporary Art and the Fundación/Colección Jumex in Mexico City. Barry Frydlender continues on his journey of creating visual records but this time, he picks L.A. for his focus. In his "Life in L.A." series, Frydlender captures the essence of 10 different neighborhoods, accumulating dozens, sometimes hundreds, of individual shots over the course of several hours, then assembles them seamlessly with a computer. 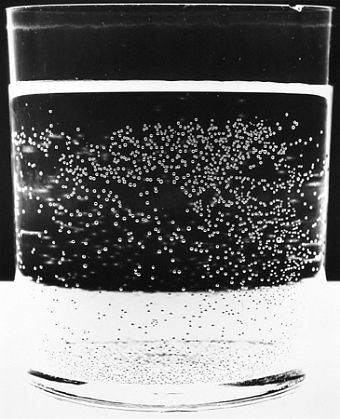 This method yields two distinctive results: Although the camera is small, Frydlender's big prints are unusually sharp and precise. And, while the picture describes a unified space, it is not confined to a uniform period of time. Clues to the passage of time (such as figures that appear more than once) disclose the artificiality of the image and invite careful scrutiny of its rich details. Barry's work is included in the permanent collections of the MoCA in Los Angeles, the MoMA in New York, The Getty Museum, The Israel Museum, The Tel Aviv Museum, and The Museum of Fine Arts, Houston, to name a few. He was born in Israel in 1954 and currently lives in Tel Aviv. 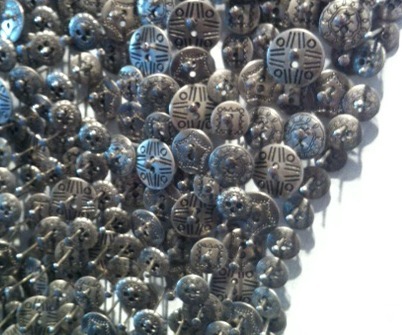 Using common, mass-produced fashion materials, Ran Hwang creates striking works of art that transform everyday objects. Sparkling buttons, shimmering beads, and long spools of thread are affixed to wood panels with thousands of pins to form Buddhas, temples, urns, and cherry blossoms-all iconic symbols of Zen Buddhism. 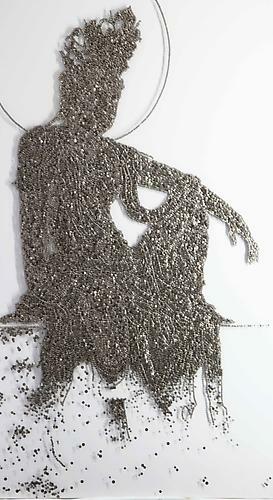 Rest II, 2009 (above) depicts a Buddha elegantly coated with layers of silver buttons and beads intricately patterned to form the ornate figure. Hwang contrasts the figure's solid form with a spattering of buttons and beads that fall from the edge of the work into the negative space that surrounds it. This notion of the artwork's deterioration is common practice in Hwang's pieces as she reminds the viewer of the dichotomy of permanence and impermanence, and ultimately the fragility of life. Zen Buddhism is apparent not only in Hwang's motifs, but also in the process of constructing the works. Weaving thread, creating hand-made paper buttons, hammering each pin approximately 25 times until it is secure are all time-consuming tasks. The monotony and repetitiveness of these actions require the utmost concentration and discipline, recalling the meditative state practiced by Zen masters. Born in the Republic of Korea in 1960, Ran Hwang lives and works in both Seoul and New York City. 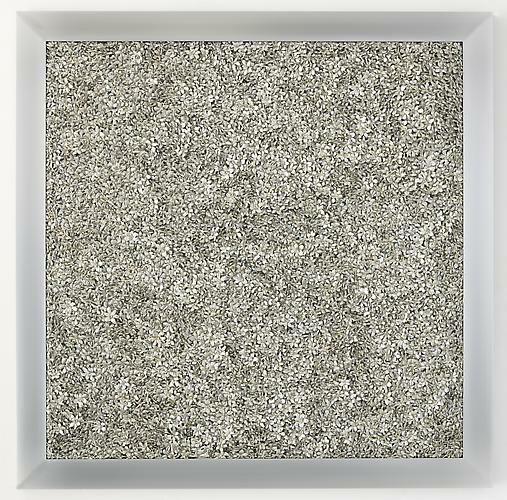 Hwang's work is in numerous private and public collections including The National Museum of Contemporary Art, Seoul and The Hammond Museum, North Salem, NY. Another artist who uses everyday objects is Rachel Lee Hovnanian. 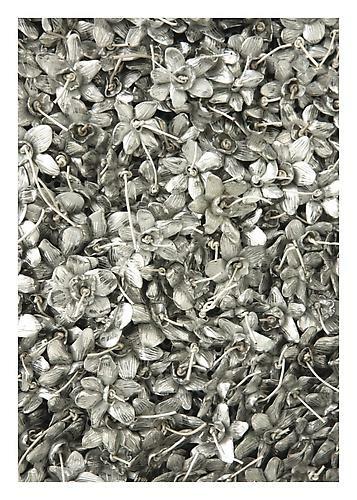 Her large panels, metallic in tone and sheen are heavily textured, made up of thousands of tiny narcissus flowers, cast in metal and painstakingly applied by hand to a metal backing. She calls them the motherboards; "it's the idea that we get sucked into screens with our computers, phones, electronic devices," Hovnanian says. Narcissus was an immortalized youth in Greek mythology and the epitome of attractiveness and male beauty. He looked at himself everywhere he had the chance: in the mirror, the water; he could never pull away from his own image until he died looking at himself. Rachel's current works continue this exploration into her "Power & Burden of Beauty" series. Liz Cohen is a photographer and performance artist, whose multi-media work is exhibited both nationally and internationally. She is best known for her recent project, "Bodywork," in which she transformed an East German 1987 Trabant automobile into a 1973 Chevrolet El Camino. Cohen drove across the dessert in it taking self-portraits. Born in 1973 in Phoenix, AZ, she was appointed Artist-in-Residence and Head of the Photography Department at the Cranbrook Academy of Art. Korean-born Chul Hyun Ahn is a member of a group of young light artists who creates meditations on Zen notions of the infinite. 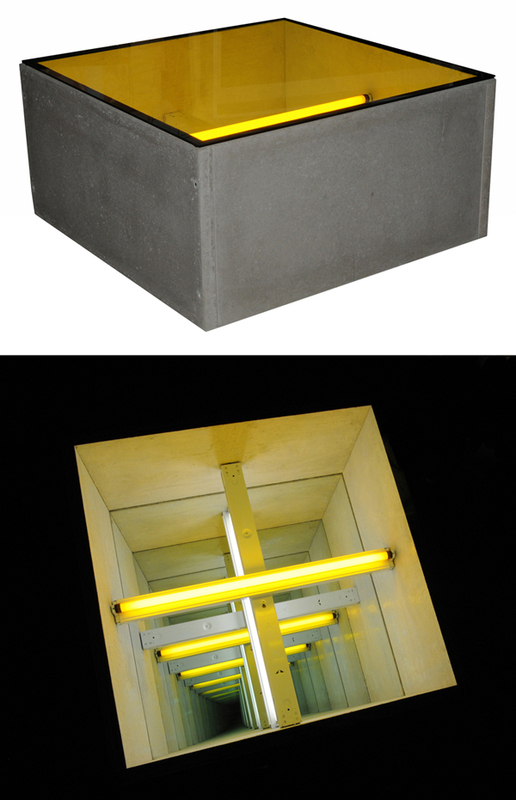 Ahn's multiple on-going "Tunnel" sculpture series explores the limitations of space and optics. It suggests a rabbit hole to another world, utilizing light, color and illusion to investigate infinite space. He tricks the viewer with two-way mirrors and reflective lights in order to create his mesmerizing environments. John Chiara photographs cityscapes in a process that is part photography, part event and part sculpture: an undertaking in apparatus and patience. 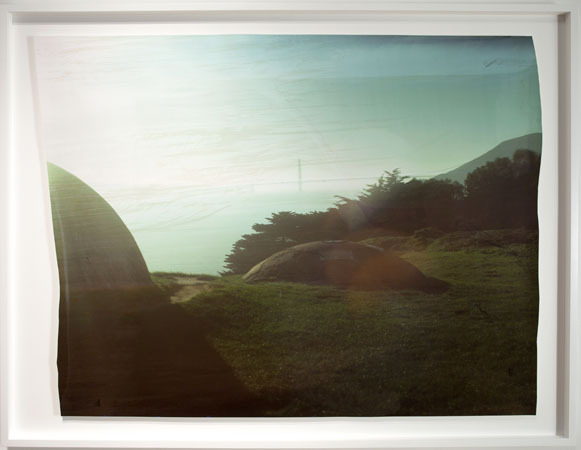 His process involves composing pictures from the inside of a large hand-built camera, that is mounted on a flatbed trailer, and produces large scale, one-of-a-kind exposures. Hand-cut in the dark, Chiara's photographs are of soft, faded hues that relay an ephemeral quality. He encourages viewers to spend time with his work in hopes that the images will evoke emotional responses of one's childhood. John is a native Californian who lives and works in San Francisco. 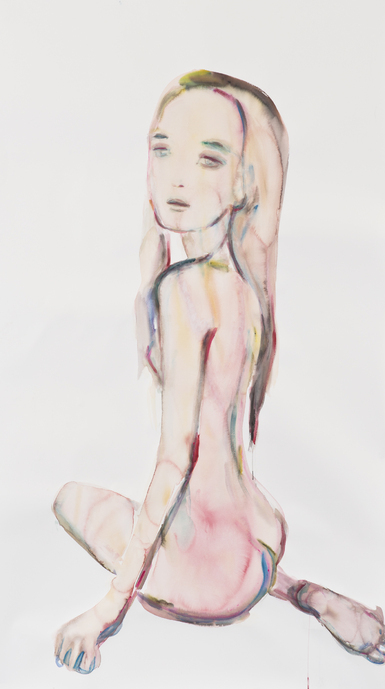 Like blurry after-images, Kim McCarty's watercolors hover between past, present, and future. Working quickly, at times using only a single color and at others a bruise-inspired palette of yellows, greens, and browns, McCarty's portraits evoke a sense of uncertainty and curiosity. A graduate of UCLA and the Art Center College of Design in Pasadena, McCarty is in the collections of the MoMA, UCLA Hammer Museum and the Honolulu Academy of Art. Stay tuned for more artists and the TAG ARTS website re-design coming soon. Work is available by all of the artists mentioned above. Please contact TAG ARTS if you are interested in seeing more work by a specific artist.